Buygether is no e-commerce shop. It is no search engine for goods. It does not suggest you what to buy, where to buy or how to buy. You have to freely, intelligently and conscientiously decide your purchase. The service is open to anyone and free, because it aims to sustain the birth of free and intelligent purchasing communities. In order to use Buygether you have to register. You have to specify a username and your email address. Then you'll receive an email with your account: username and password. Your email address will be not shown to any other users and is masked by Buygether. As registered user you can join existing groups or create new groups from scratch or copy existing groups. Hereafter some of these steps would be explained more in details. A group represents a purchase action: it could comprise the articles sold by a farmer close to your town or a selection of articles from a shop. Therefore you must create or join more than one group to get a good portfolio of products. To displays all your groups: the ones you created, the ones you joint, the ones to whom you've been invited and finally the public groups. Each group is like a table whose participants and articles are arranged in columns and rows. Each user can set his orders for a specific article or write a comment visible to all other participants. Once you are in your group you could add the articles you'd like to buy. Invite your friends. You can also create a public group and give the possibility to anyone to join it. An invited user can accept or deny the invitation. Once accepted, he/she can participate to the group according to his/her role: buyer, seller and assistant. The buyer is everyone who is allowed to set an order in the group. The assistant is a volunteer, chosen by the owner or other assistants, which should support the organization of the group. The seller can only see the total amount of orders, so that he could prepare the delivery in advance. To create a new group from zero and became its owner. Articles and participants could be imported by one of your existing groups To create a new group by using the articles of an existing group. In that case the articles of your new group would be synchronised with those of the origin group. To accept an invitation and become participant of a group. Each group, before being closed, should step into two phases: a first phase in which the buyers' orders are collected and a following phase in which the delivered articles are accordingly distributed to the participants. Here the orders from the participants are collected. An order is a wish of the participant to buy an article that could be expressed by a comment (ex. “I would buy a half a box”), by a quantity (ex. “1/2” of a box) or by clicking a checkbox (ex. “Interested”). It is in this phase that the participants decide with which other participants to share one or more articles. Buygether collects the orders from the buyers so that, when all the orders have been collected or a limit date for the ordering is expired, the owner and the assistants can decide the final quantities for each article to be bought. They would contact the sellers, pay the costs and collect the delivery. 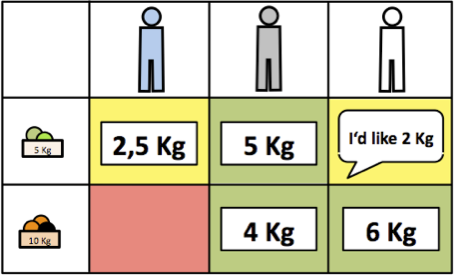 The table automatically calculates and displays the ordered quantities and the corresponding costs for each participant taking into consideration the eventual delivery cost. Here the bought articles and the costs are divided within the participants. The bought article could vary in quantity from what have been ordered. For example, the seller could have delivered a wrong amount of articles. In this phase the participants could still communicate to each other in order to better share the delivered articles. 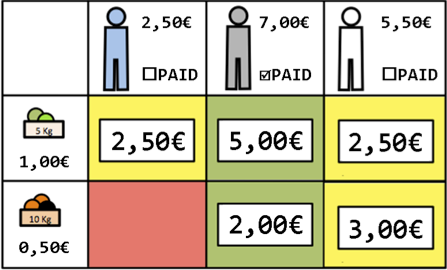 Buygether automatically calculates the actual costs which each participant should pay according to the final costs and the bought quantities. It eventually calculates discounts and eventual rewards for the buyers. The owner and the assistances organize the distribution of the articles to all participants within the group. When all articles have been distributed and all costs have been paid, the group can be closed. At a latter stage, the group could be printed, archived or restarted. Note: Buygether does not offer any financial or payment functionality. The owner and the assistants of the group should choose how to pay the seller, how to let the articles be delivered, and how to distribute them and get the amount from the buyers by themselves. Accordingly the owner of the group should be responsible for the correct development of the ordering of the articles and distribution of articles and costs. Buygether offers you a tool to simplify the management of a puchasing group, and it is not responsible for bad behaviour or eventual abuse or violation of the users. By registering in Buygether, each user agrees to behave honestly and correctly and according to the terms and conditions of the website. Each user and participant of a group is responsible of his actions. at the bottom of each page, if you believe that a user or a seller is not behaving properly, please send an email and report it to the Buygether Team. Buygether would evaluate the case and eventually disable the user or set the seller in a black list. You can then help a producer in difficulties, e.g. due to a cataclysm or to a financial problem, like we did on 2012 with the Caseificio Castelnovese. You can then sustain a farmer in your neighborhood and eat good and healthy food while reducing the CO2 production by reducing the transportation. You can order traditional unique products by directly contacting the producer, like we did with the traditional chocolate from Modica in Sicily or with prosciutto from San Daniele dei Friuli. You can directly contact and personally know producers and better know what you buy or what you eat. You can stay in contact with other people and friends which participate to the purchase. You can know new persons in your neighborhood. You must reply to fundamental questions like what you buy, how you buy it, with whom you buy it and why you do it. Buygether started on 2009 in Munich from a group of friends and colleagues for handily organizing purchase actions at the local market. It was then improved for supporting the purchase of goods organized by colleagues and finally published for sustaining cheese producers after the earthquake in Italy on 2012. Aim of the idea is to provide a free and common platform for Ethical Purchasing Group. If you'd like to know us, if you'd like to participate, to support us or if you have questions or suggestions, feel free to contact us. You are very welcome!